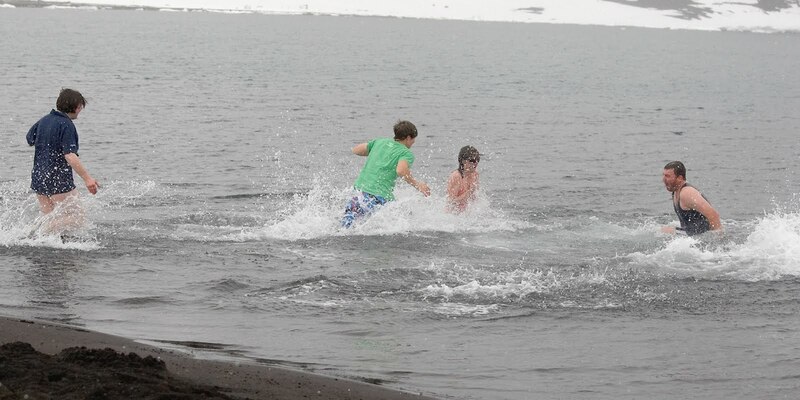 Probably the craziest thing I’ve done in a long while was taking the plunge, and going for a dip in the ocean at Deception Island, on the Antarctica Pensinsula. There is actually a precedent for this, as parts of the beach are heated by volcanic activity. That said, it only really works if a) the tide is right, or b) you dig a pit in the sand where it’s hot. Seeing as we met neither of these conditions, it was absolutely freezing. 6 of us dared to take the plunge in the end. We undressed on a patch of snow (to keep our clothes clean… in retrospect, I wonder why we bothered), and then ran done the beach and into the water, where we stayed just long enough to prove the point, before hobbling out again on our poor frozen feet. Did you follow up this plunge with a plunch in the North Sea on 1.1.2010 ? Didn't feel like I needed to prove anything more, no!